What should be the response of Christians and the church regarding social injustices? 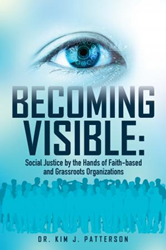 Within the pages of Becoming Visible: Social Justice by the Hands of Faith-based and Grassroots Organizations ($15.99, paperback, 9781545612279; $7.99, e-book, 9781545628959), readers will discover what it takes to to speak, act, and become visible in our world that appears to be ever losing its vision relative to truth, justice and unconditional love. "This book inspires faith and grassroots professionals to gather in organized advocacy to address social injustices waged against vulnerable populations," Dr. Kim Patterson states. "Becoming Visible will facilitate partnerships between nonprofits and church leaders. It will empower marketplace Christians to utilize their spheres of influence to affect change. It will inform dialogue on college campuses among millennials." Becoming Visible is not a politically correct message. "This book joins the emerging wave of nontraditional thinkers seeking a faith that impacts culture, as opposed to being impacted by changing culture," the author states. Dr. Kim Patterson has served as a pastor for more than 25 years. He has a doctoral degree in leadership from Regent University. Patterson is the president and founder of a mentoring program for at-risk males. His previous book was Swift Justice: Leveling the Playing Field for America's Re-Entry Citizens. Xulon Press, a division of Salem Media Group, is the world's largest Christian self-publisher, with more than 12,000 titles published to date. Retailers may order Becoming Visible: Social Justice by the Hands of Faith-based and Grassroots Organizations through Ingram Book Company and/or Spring Arbor Book Distributors. The book is available online through xulonpress.com/bookstore, amazon.com, and barnesandnoble.com.